New tile is one of the best ways to give your bathroom a fresh, modern look. Because options in material, colors, and patterns are endless, this is a chance to truly be creative as you design your remodel. However, all those choices can be a little overwhelming. Read on to learn about some of the hottest new trends in bathroom tile, from the wild and funky to the classic and understated. You’re bound to get inspired after checking out these ideas. These bathroom tiles lend a sparkly look to even the starkest of bathrooms, and are available in a variety of finishes and colors. Use for backsplashes and accent tiles for a subtle shine, or tile your whole bathroom in glass for a luxurious escape fit for a mermaid. And if you want to go green, it’s easy to do so by choosing recycled glass. 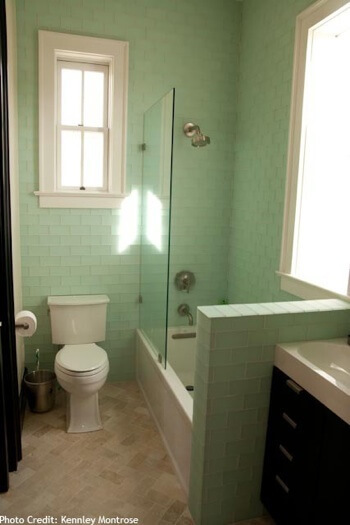 Using small, colorful tiles in a mosaic pattern gives your bathroom a retro look. To keep the look from being dated, stick to just a few key colors rather than the entire rainbow of the 1970s mosaic look. Try using a grid motif with a very intentional pattern. Or rather than an entire patterned bathroom, use this look as a backsplash accent. This trend fits in with the move toward a more organic look that brings the outside in, with curved lines and natural materials. 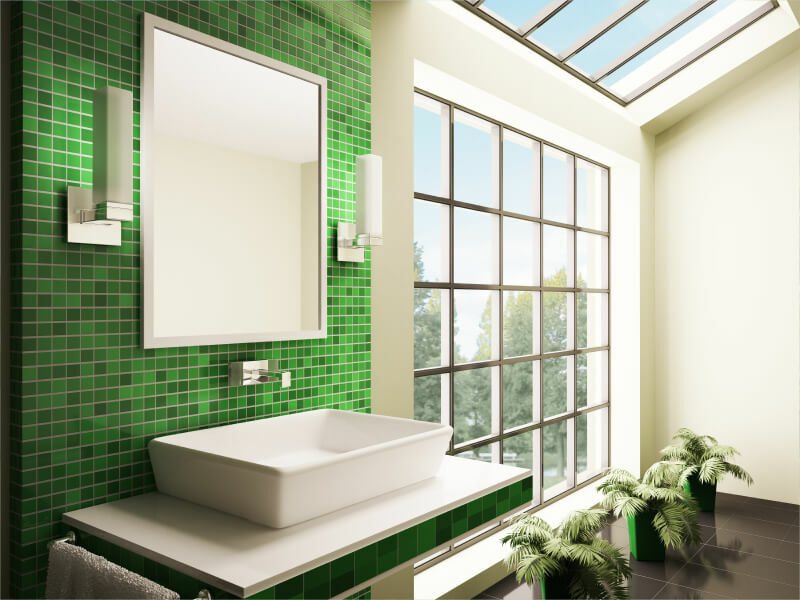 Choosing pieces that are imperfect makes this type of tile the perfect choice if you want your bathroom to call to mind a natural oasis; and as a bonus, this is a great way to go green in your bathroom remodel. Used primarily for bathroom flooring rather than traditional linoleum or tile, these patterned cement tiles give your remodel a graphic flair that is a good way to add color to a room with neutral walls. Pair with white fixtures and decor for the most modern look. And because they’re often handmade, this is a great way to give the room a truly unique feel. While real marble is a classically luxe look, it can be quite pricey to implement in your remodel. In addition to the high price tag, it’s very delicate and needs extensive care and maintenance. Instead, try porcelain tiles that mimic the look of marble without the cost. Far from being phony, it’s hard to tell the difference between porcelain and the real thing. 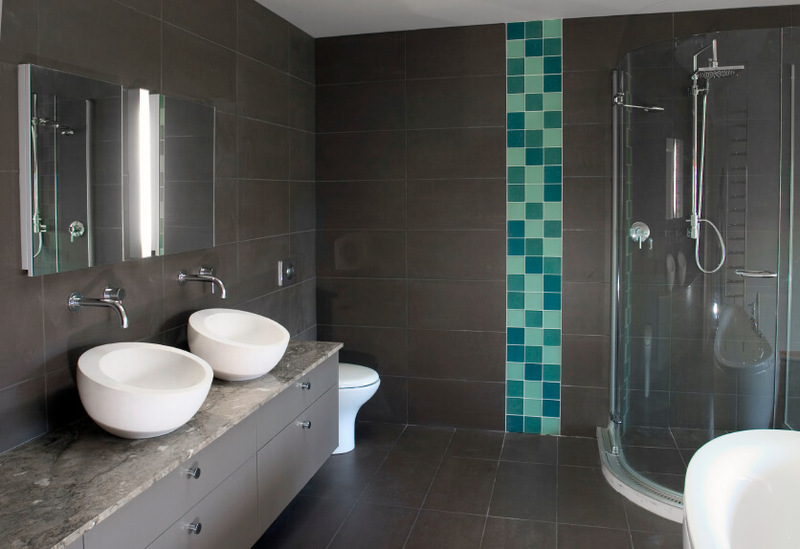 When you’re looking for tile, consider implementing one or more of these trends in your new bathroom. For the most longevity, stick with high-quality materials and neutral colors, particularly if you may want to sell your home in the future.